Using a powerful yet lightweight database structure, Evidence Scribe allows you to add, edit, search, organize, export, and print debate evidence in an intuitive, streamlined fashion like never before! The program was developed from start to finish by Isaac Evans, an NCFCA national semifinalist, with development reviews from other debaters. Best of all, Evidence Scribe frees you from worrying about the complex, technical aspect of formatting and organization - allowing you to focus on the debate itself. Whether you're a novice or a pro, Evidence Scribe is the tool you need so you spend less time cutting, pasting, reorganizing and reformatting evidence and more time focused on debating, researching and reviewing the content of your evidence. Any debater will tell you that while it's relatively easy to find articles on the internet and read them, the most time-consuming, dull, and repetitive part is actually getting that evidence formatted correctly into your brief so that you can print it off and use it in the round! 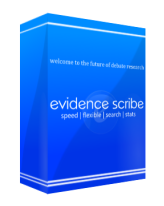 So, here's why you'll love Evidence Scribe. When you're doing debate research, you don't want to have to waste time flipping through windows and tabs, jumping from the keyboard to the mouse, or trying to find the last piece of evidence you entered. All you should be thinking about is the content itself. Now you can have Evidence Scribe as your own "personal secretary" to do just that. Evidence Scribe can cut your research time by over 50%, and when you start to think about all the research you do throughout the debate season, that really adds up. Evidence Scribe makes formatting a breeze for the novice and advanced debater alike - because there's no formatting to be done! Evidence Scribe automatically generates perfect formatting when it exports your brief to the format of your choice. But the best part is that you're not stuck with the default styles - if you don't like the way something looks, you can make your own! You could even customize a style for your club, so that all your evidence looks consistent. Evidence Scribe supports dynamic conversion with styles to webpages (HTML), OpenDocument (ODT), and Open XML (DOCX). 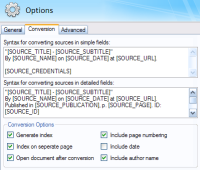 Evidence Scribe also offers static conversion directly to Rich Text Format (RTF) and pre-2007 Word Documents (DOC). Even better, you don't have to have OpenOffice or Word installed to generate the documents. So it doesn't matter at all if your club members use different platforms or word processors - Evidence Scribe makes it all the same! And what's more cool is that Evidence Scribe can generate an index with tags and page numbers at the start of the brief automatically, as well as sorting the entire brief by stock issue (with headers!) and automatically filling out your header. Evidence Scribe also does things you probably never thought were possible in Word. For example, briefs exported by Evidence Scribe have the tag, citation, and evidence block "locked" togethor so that they're always on the same page! You don't have to worry about getting up to read a piece of evidence and discovering that the citation is sitting back at your table on the previous page. Just choose a style, a format, and click "Convert." 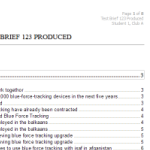 You have 36 briefs and 1,839 pieces of evidence. Quick, where's the one with that thing the president said about how "NATO is our premier defence alliance"? Evidence Scribe lets you search all your evidence instantly, rather than opening up document after document and clicking the "Find" button a few hundred times. You can search everything - or just the tags, the blocks, the dates - it's all up to you. With Evidence Scribe, you get the portability of your Word documents with the power of a database. Unlike most database programs, Evidence Scribe lets you store your evidence the way you always have - in briefs, as opposed to one gigantic database. Evidence Scribe uses XML, an industry standard for storing information, to store your research. Additionally, Evidence Scribe has built-in email functions, allowing you to send a brief (or several) to your club in seconds. Your and your club will save time and worries about portability and compatibility. Evidence Scribe is so easy to use, it lets even beginning debaters create advanced and professional briefs. You don't have to worry about mastering the subtle nuances of Word formatting; all you have to do is click "Add." Evidence Scribe's friendly and intuitive user interface makes the rest of adding evidence a piece of cake. It's an incredible feeling to click the "Convert" button, choose a style, select a file format, and then watch as Evidence Scribe automatically transforms your hard work into a beautifully laid-out document, ready for printing. All the default styles that ship with Evidence Scribe are optimized for legibility and readability - the fonts are specially chosen to make them easier to read during a debate round. Evidence Scribe's advanced stylistic features allowing you as a debater to maintain your focus on the content of your evidence and instantly have easy-to-read, professional briefs. With Evidence Scribe, you can instantly re-arrange the screen to put your Add Evidence window right next to your browser, all by clicking a single button. From there, just drag and drop the evidence you want right into your brief! Once you've entered the URL, Evidence Scribe can even find the source title for you! When you purchase Evidence Scribe, you recieve a command center layed out specifically for debate. You can see all your debate evidence (and search it) from right within the program! Within the briefs themselves, it's easy to sort by tag, source, impact, or stock issue. Best of all, your evidence is automatically sorted before export! Being organized has never been easier. Evidence Scribe has been used by multiple debaters from clubs around the nation. For a sampling of what they have to say, check out the reviews page. "...stunning in its simplicity and ease of use."